Matthew Bourne's pantomimes -- somewhere in the cracks between dance, theater, and cinema -- may have appeal to broad audiences. The last one to come to the Kennedy Center, his Sleeping Beauty, left me cold. 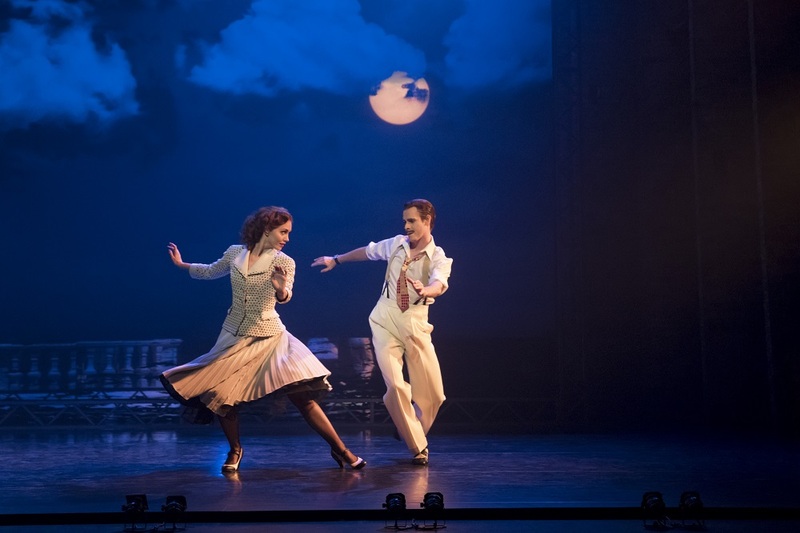 His latest, an adaptation of The Red Shoes, the beloved film directed by Michael Powell and Emeric Pressburger, with an Oscar-winning score by Brian Easdale, opened on Tuesday night in the Kennedy Center Opera House. Premiered this past December, it proved another disappointment, but a large audience seemed to like it just fine. The film is legendary among ballerinas and ballet fans, so much so that to attempt to recreate it on the stage inevitably seems like an act of hubris. Bourne has said he did not want merely to recreate it, but fans of the movie may puzzle at how the story has been altered. Easdale's score has been jettisoned, replaced by gorgeous excerpts from the film scores by Bernard Herrmann (Citizen Kane, The Ghost and Mrs. Muir, Hangover Square, and Fahrenheit 451, arranged by Terry Davies) -- regrettably all played in recorded tracks, often at ear-piercing volume. Pieces of Chopin's music, used in the section of Les Sylphides shown in Act I, are preserved. The worst change is the transformation of the imperious ballet impresario, Boris Lermontov, changed from a man who worships dance as a religion, and tries to force his ballerinas to do the same, to someone who is merely in love with his prima ballerina. Sam Archer did his best to give this much flimsier character individuality, even though it was hard to imagine Boris Lermontov ever lowering himself to dance in any way. Ashley Shaw captured most of the wide-eyed optimism of Victoria Page, the dancer from a wealthy family who works her way into Lermontov's company, even without Moira Shearer's bright red hair. The most vivid dancing came from Marcelo Gomes, the star ballerino seen with American Ballet Theater, as the aspiring composer Julian Craster. Most of the other dancing was, unfortunate to report, forgettable. Many of the scenes in Bourne's version seemed completely unnecessary, background on the partying of Lermontov's troupe or the burlesque show where Victoria Page wasted her talents. Somewhere the dark message of the Hans Christian Andersen tale, more brutal certainly than the film but found there in a sublimated form, got lost. On opening night there were some significant technical issues, including a delay about fifteen minutes into the first act, when set pieces did not fly into properly and the show was put on hold for about ten minutes. This was followed by what seemed like a delay at the start of the second act. Glitches can happen, of course, in any production, but in Bourne's style, where so much more rests on the technical aspects than on dance or dramaturgy, these silences were deafening. The Red Shoes runs through October 15, at the Kennedy Center Opera House.